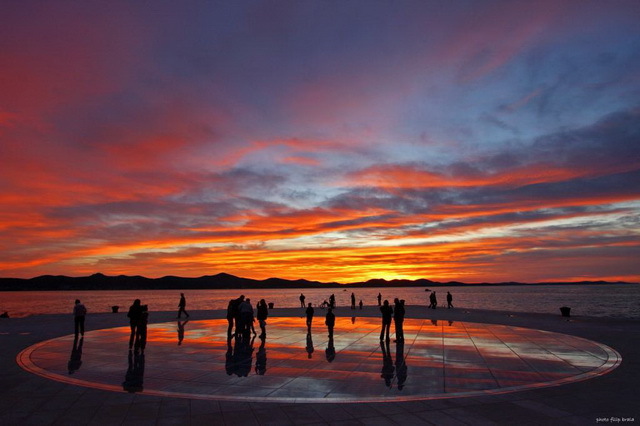 On this tour you will discover that Croatia although not being a large country is a land that is Mediterranean, Central European, mountainous and flat, coastal and continental. 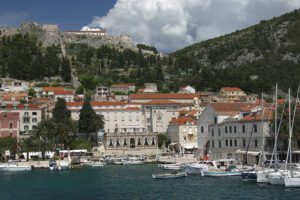 You will visit Croatia’s best known national park , included in the UNESCO List of World Heritage, explore the medieval coastal towns and tiny fishing villages, taste the local gastronomical specialities, learn about the culture… all in the company of a friendly and knowledgeable guide who will be happy to answer your questions. Zagreb, the capital of Croatia. 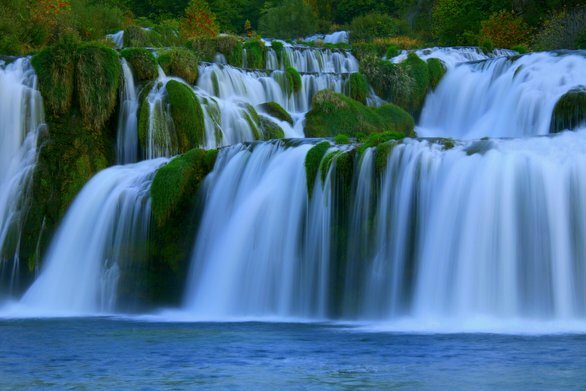 Waterfalls of the Plitvice Lakes. Trogir, the medieval gem of Croatia, a UNESCO Cultural Heritage site. The mountain top of Biokovo. A day cruise on the Adriatic. 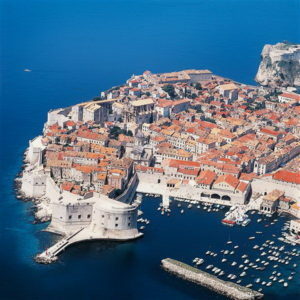 Dubrovnik the “Pearl of the Adriatic”. Zagreb, the capital city of the Republic of Croatia, is an old Central European city. For centuries it has been a focal point of culture and science, and now of commerce and industry as well. 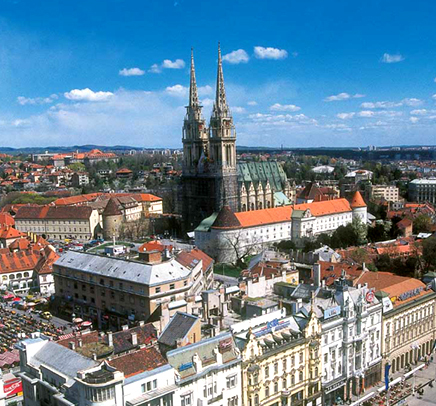 Zagreb is also the hub of the business, academic, cultural, artistic and sporting worlds in Croatia. Many famous scientists, artists and athletes come from the city. During our visit we discover the Baroque atmosphere of the Upper Town, picturesque open-air markets, diverse shopping facilities, an abundant selection of crafts and a choice of homely cuisine. The guided tour of the old town includes a visit to St. Mark’s church, reknown for its’ colorful tiled roof depicting the Croatian Historic emblem, the main square “Ban Jelacić” and the cathedral St. Stefan. Visit to Zagreb’s famous cemetery “Mirogoj”, considered to be one of the most beautiful cemetery parks in Europe and, thanks to its design, numbers among the more noteworthy landmarks in the City of Zagreb. In the arcades of the main building, designed by the architect Herman Bollé, are the last resting places of many famous Croatians. Nestled amongst a cluster of lush mountain valleys is a mysterious ancient forest known as the “Devil’s Garden”, home to the brown bear, lynx, black stork and Ural owl – living in an enchanted world of thunderous waterfalls, cascading lakes, and subterranean caverns. Underneath the Dinaric Mountains, rainwater gathers and rushes through subterranean caverns, drawing lime from the stone. Here, stalactites hang and species dwell that are so rare and strange they defy the imagination. 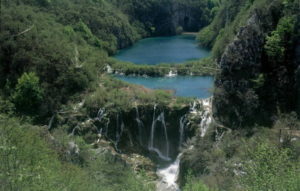 This Eden is Plitvice Lakes National Park, the oldest national park in Europe. Today we explore this magical world of Plitvice and discover its unique animals and breathtaking landscape during a walking tour of about 3 hours (on foot, a boat trip crossing the biggest lake and a panoramic bus drive). As by now we are hungry as bears, the national restaurant “Licka Kuca” awaits us with its regional specialties. In the late afternoon we arrive on the Adriatic coast. “Breathtaking” describes the scenery today as we drive south along the Adriatic coast, stopping on our way to Makarska Riviera to enjoy the splendid cultural heritage of the coastal medieval towns. We will soon understand why the Greeks and Romans chose the eastern Adriatic coast as their main sailing route for their trading expeditions, forming many settlments and towns in sheltered bays of the coast and nearby islands. 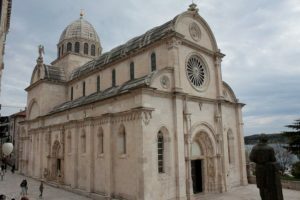 In Šibenik, we visit the Cathedral of St. James, a successful fusion of Gothic and Renaissance art which bears witness to the considerable exchanges in the field of monumental arts between Northern Italy, Dalmatia and Tuscany in the 15th and 16th centuries. Trogir is one of the remarkable examples of urban continuity on the eastern adriatic coast. The orthogonal street plan of this island settlement dates back to the Hellenistic period and it was embellished by successive rulers with many fine public and domestic buildings and fortifications. The cathedral with the most magnificent portal in Dalmatia, the work of the sculptor Radovan, decorating its main entrance, dominates the main square. The many little streets and squares of Trogir together with lively locals, give it an easy-going and typically Mediterranean atmosphere. The story of Split goes back to the end of the 3rd Century, when the Roman emperor Diocletian, tired of ruling, suffering from arthritis and nostalgic of his homeland, gave orders for a palace to be built on the coast of the Adriatic just outside the largest Roman town on the east coast, Salona. The Peristyle, the heart of the palace had always been the liveliest square of Split, where a 3500 year old sphinx sits beside antique colonnades guarding the entrance to a mausoleum transformed into a cathedral, opposite a renaissance palace turned coffee house. We have seen that the Dinaric mountain chain is parallel to the Adriatic coast and in certain places, like here on the Makarska riviera, the mountain Biokovo, seems to have formed a long mountain wall (36 km long) in the immediate vicinity of the sea. Today we drive one of the highest and most spetacular roads in Croatia, passing through different vegetation zones and forests of beech, fir and black pine before arriving at Saint George, the highest peak on Mount Biokovo at 1762m. Arriving at the top of the mountain the view of the central Dalmatian islands, Makarska riviera and Zagora is spellbinding. Biokova has a rich variety of flora and fauna boasting many endemic species, such as the dwards bellflower decorating the bare rocks. Among mammals are dormice, bats, chamois and wolves. A number of rare birds such as the golden eagle nest on Biokovo. Descending the mountain road we pass through the village of Podgora, making our way to Makarska, the center of the riviera. A very popular summer resort with charming little streets leading to its pretty churches, squares and picturesque harbour. 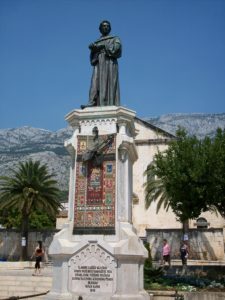 In the centre, on the main square is a statue of the famous Franciscan friar, Andrija Kacic Miosic, it is just in front of St. Mark’s cathedral and behind it the monumental scenery of Biokovo, together forming a picture of cultural and natural harmony rarely seen. put together by the friar Jure Radic, a passionate biologist. Yesterday we climbed Mount Biokovo and enjoyed the view of the islands and the coast of the Makarska riviera, today gives us a different perspective of the coast and the mountain behind it by sailing out to the island Hvar. We board a traditional fishing boat from the village of Podgora, sailing along the Makarska riviera to discover the secluded bays and beaches washed by the clear blue sea, sometimes so calm we can see through for meters on. Sailing the quiet waters of the channel formed by islands parallel with the coast dominated by the mountain Biokovo, for a moment thinking we were sailing on a tranquil lake in Swizerland, we arrive to island Hvar to the well protected port of Vrboska. Walking through the little village we are reminded of its turbulent history when villagers were forced to build a church-fortress to protect themselves from imminent dangers coming from the sea – pirates! Enjoy the barbequed fish and home made wine served on board. From Makarska riviera we take the scenic coastal road southward towards Dubrovnik, the culminating point of our cultural journey through Croatia. Encircled by its famous walls Dubrovnik, once called Ragusa, had been one of the most important maritime powers of the Mediterranean. During five centuries an aristocratic republic, an independent city-state and a grand rival of Venice. Masters in the art of politics, renowned for their able Diplomats with remarkable negotiating skills, the city-state managed to preserve its independence, sometimes paying a high price to Venice or later the Ottomans, until in 1806 Napoleon’s troops arrived and put an end to the “Independent Republic of Ragusa”. During our morning visit in the company of a local guide we will learn about the rich and glorious history walking through the streets with wonderfully preserved Gothic and Renaissance monuments, churches, monasteries and palaces, and soon understand why Dubrovnik has been put on the UNESCO World Heritage map. In the afternoon you may wish to leisurely wander and explore the many alcolves and alleys of the old town or take the popular walk around the fortified walls. Todays activities will be determined by departure times. For those with late flights it is a good opportunity to linger in Dubrovnik, perhaps spend a few hours at Lokrum island (left) or Cavtat, which is very close to Dubrovnik Airport. We will be at your service right up to your departure, when it will be time for you to say farewell – not goodbye! – to Croatia and head home with some wonderful memories. Come back soon!